A zip cardigan by Banana Republic. A recent post over at Une femme d’un certain âge called “The Little Jacket That Could” was an interesting read about how Deja prefers a softly-structured jacket, either in knit or fabrics that drape, as a go-to piece for always looking polished. It got me thinking that, as much as I love jackets in theory, and especially on other people, my heart belongs to the cardigan. I have about twenty cardigans in my closet, as opposed to only four (yes it’s true) jackets! Six of my cardigans are the J. Crew Jackie cardigan, which, in my opinion, is still the best basic cardigan on the market. The Jackie is offered in a rainbow of colors and it’s a style that regularly goes on sale too! J. 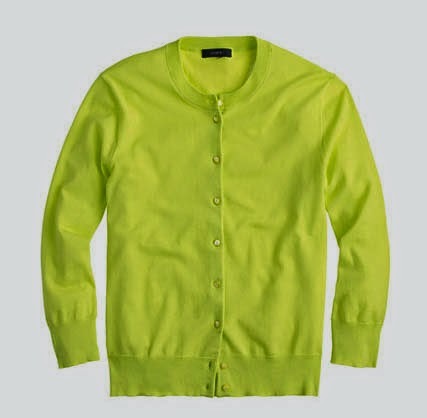 Crew Jackie cardigan in Bright Kiwi. I don’t like a sloppy or oversize cardigan, which I think can end up looking too big on the person wearing it. My favorite cardigan shape is cropped, slightly tight, and ¾-sleeved. I think it looks polished and works well with jeans, trousers, or a skirt. My other favorite, which is a new style for me, are the two zip cardigans I picked up in the past few months, one from Banana Republic, above, and one from Old Navy. Both of them are well-made and feel like a combination of a cardigan and a jacket in the way they fit and are structured. While a jacket can sometimes feel constricting to me, these zip cardigans are so easy to wear. A basketweave zip cardigan by Old Navy with faux leather trim. Sequined cardigans by L’Wren Scott for Banana Republic. These are so fun to wear! And still available on eBay! A cardigan is part of my daily uniform and during this time of year when the weather can still be chilly I like to wear my wilder cardigans that feature patterns or are boldly colored under a sedate black peacoat, almost as if they are waistcoats, just to add some color or texture to an outfit. 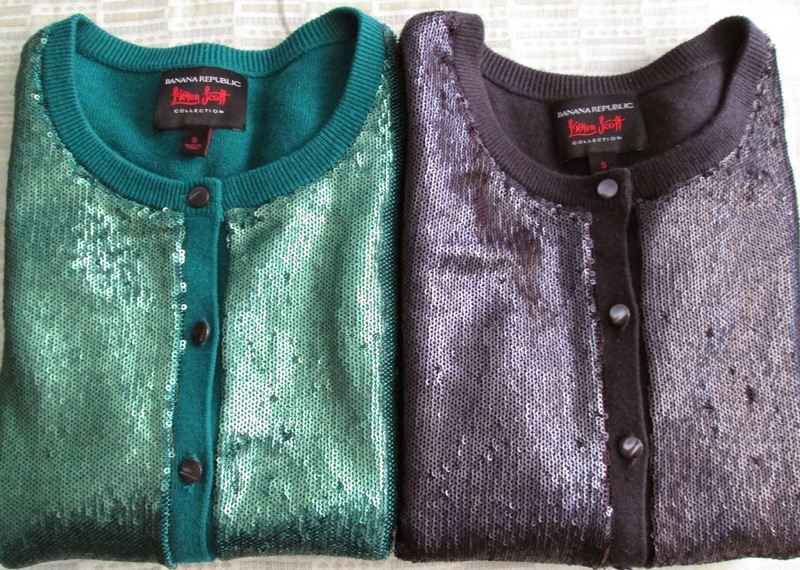 I also like to wear cardigans out at night too, if they have sequins on them (naturally! ), or are made of lace. 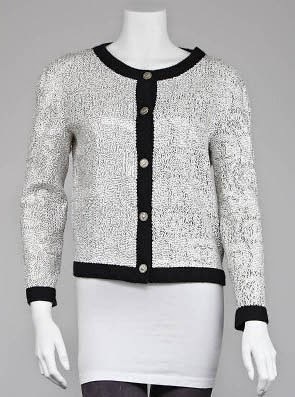 A Chanel sequined cardigan. Photo by Yoogi’s Closet. I’m starting to come around to the fact that maybe instead of a Chanel jacket, which has been on my fashion wish list for awhile now, maybe I should be dreaming of a Chanel cardigan! I spied this one on the Yoogi’s Closet website. It features printed and striped sequins, how crazy is that? 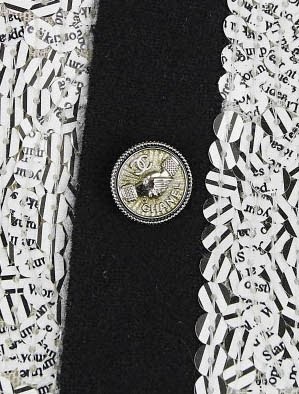 Detail of the sequins and button. Love! Which do you reach for most often, a cardigan or a jacket? I have always thought you looked great in cardigans, Jill. That first one is really cute. I am more of a jacket girl, but it has everything to do with body shape and what I feel slimmer in. Have a great weekend! I like the sequins and stuff---otherwise cards become way to neat and/preppy for and I feel awkward! Now that I'm in NC I am starting to understand the perfectness of the cardi! Oh my. That Chanel cardigan is gorgeous! I am the same as you. I like my cardigans fitted. I own quite a few. (I'm not going to say how many!) I often wear them with my fit and flare dresses. They add another bit of retro flashback to my vintage ensembles. I am totally with you on the cardy thing! I only have three jackets and rarely wear them b/c they feel so restricting. Yes about 20 or 25 cardis. Love them. all cotton, 3/4 sleeve, slightly fitted.